I have always loved music, having played the piano from when I was five. My mother and grandfather were my musical inspiration. I also spent many years in our church choir and found great solace in the rhythm of weekly singing – much as I do now! 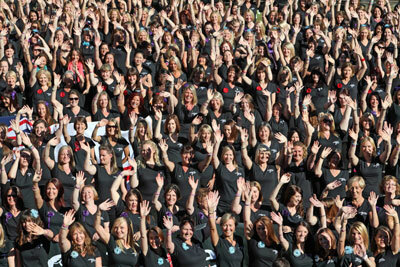 Where was the Military Wives Choir idea born? My husband, Hugo, and I were posted to Catterick. It was the autumn of 2009 and the brigade was deploying to Afghanistan in the spring. I found my new life there quite a challenge as I knew no one, we didn’t have children at the time and Hugo was continually away training. I had given up my job as a psychotherapist in Wiltshire and found myself hundreds of miles from family and friends. At times it felt quite isolated. I noticed that so much of the welfare, understandably, was focused on children and I thought “but what about us, the wives?”. While friends and family try to help and military welfare has its role, I had a really strong sense that as military spouses we are best placed to look after each other – because we have all shared experiences and can understand better than anyone how we might be feeling at any given point. I can remember the moment very vividly. I was sitting on the sofa, looking out of the window at about 3pm when it was already dark and thinking “what about a choir?”. I had run one before and really missed it. It would be a good way to meet other people and something for us, not the boys or the children. 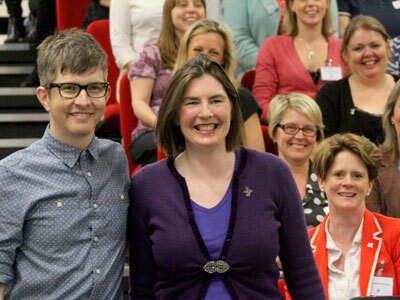 How did Gareth Malone get involved? To do this properly, we needed someone with great musical experience and I thought about Gareth Malone. Through his agent I outlined my ideas and suggested doing a concert at the end of the tour for charity. I hadn’t thought about doing it for TV, I just thought he might be able to get us up and running. Although they were hugely supportive, the timing didn’t work out. However, he was hugely excited about the idea and with backing from the MOD, they ended up filming at Chivenor and Plymouth. In the meantime, my friend Caroline Jopp and I set up our own choir with the help of a wonderful lady called Carol Gedye. The choir proved to be a huge support to us all during Herrick 12 and at the end of the tour we sang at a charity concert; proud and excited that our soldiers could see what we’d been doing while they’d been away! The choir is still going strong, providing the support and friendships that I had always hoped it would for those living a life that isn’t always easy. How do you feel singing has helped Service communities? Music is a great leveller; it helps to bridge divides in a way that I think is unique. The sole purpose of the choirs is to provide support and friendship – it’s just we’re doing it on a bigger scale with 75 choirs, rather than one! Although there have been amazing opportunities that we have taken part in, if we didn’t have that support and friendship we wouldn’t have an organisation that really means anything. It’s hard to choose but one of the best days we had was when we launched the Military Wives Choirs Foundation at Wellington Barracks with more than 650 ladies from all over the UK, Cyprus and Germany coming together to sing Stronger Together. To see ladies meeting again having moved choirs was a joy; that sense of connectedness is truly wonderful. We’ve achieved more than we thought which is testament to the resourcefulness of military wives! Our vision for the MWCF was always to set it up for the long-term; we want the choirs to be here for our children and grandchildren. Given the transient nature of Service life, choirs could easily come and go as quickly as they were set up and if we didn’t have the infrastructure behind them, there’s the risk they would just fade away. So we hope that we’ve given ladies the tools to keep the choirs going and made it as easy as possible to set up and run wherever they are posted. We are also delighted to be asked to sing at so many events around the country and we hope to keep this going to continue to raise awareness of the lives we live and the support we provide to the Armed Forces. Has Gareth continued to support you all? Gareth is our patron and a huge supporter of all we do. He understands the origins of the MWCF and knows that without its roots as a community organisation, we would not have succeeded as we have. That’s why he hosts our Musical Directors’ workshop each year, attends the annual meeting and is on hand to talk through ideas on how things are progressing. He continues to help us with some wonderful opportunities such as the Prom we recently performed at. My focus will always be on ensuring that we never forget our roots – that we are “Stronger Together”. That doesn’t mean we sob into our teacups every two minutes – it means that we can achieve so much more together than if we brave things out alone.